Looking for N CA or OR shows Nov 2-5We have an good anchor gig and would like to extend the shows If anyone is in that area - www.AaronWalkerMusic.com<br /> I'd appreciate the help! A recent thread here got me thinking about trying a BlueChip SR60 to sweeten up my Altamira M01. I'm just wondering whether I choose the round bevel as opposed to the speed bevel. I heard from BlueChip that the round tip is a bit darker but that's a subjective opinion. I have one. I'd get the speed bevel. Mine has the bevel, but I have the XR60 with the round bevel, and it's way too mellow. And I just don't like the attack it can give...glides off the strings too easily. I went with speed bevel. Still mellow and warm sounding with that round tip. The side corner edge of my KS is rounded and not too far from the profile of a SR. tip. While OK for rhythm I personally find the attack too flabby for me. I've got the SR60 with the speed bevel and I really love it! It's my favourite GJ-pick at the moment. I also have the TD60 without the speed bevel and I find it doesn't glide through the strings that easily. Speed bevel sort of develops naturally as you wear the pick, other picks not the blue chip as it barely wears after years of using it, so when I was ordering mine that to me was the only way to go. Is there a situation where round bevel is better? Thanks for the comments. I'm still on the fence about paying 50 bucks by the time the pick gets to me. If it sounds great then I guess it's worth it. I've heard great things about these picks. I spent about $25 on my current Gypsy Jazz pick and I have never felt like I overspent. The Blue Chips last forever and I think you'll be more keen to keep an eye on it. Don't judge it immediately, give it a week or so. That's about how long it took me to realize the difference for the better. But then I did a blind test with a friend where a friend was playing turned away from me and me listening and I picked out blue chip as my favorite tone among 5 or so other picks, all the usual GJ suspects. Just made comparison between SR 80 and V Pick Large Rounded Pearly Gates. 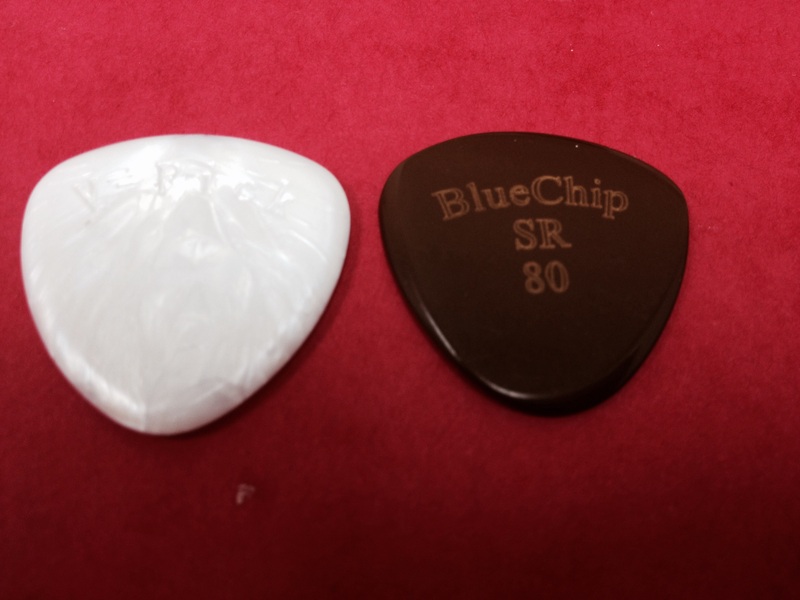 Exact same shape, V Pick is 2.75mm and has very comparable sound and feel. V Pick is $4.00. Some sanding was required to "warm up" the sound, as bevels tend to be too sharp for my taste.